Timestream®, Appleton, Maine. President. Develop and market multimedia tools, content, and titles for CD-ROM and the Internet (http://www.timestream.com). Rockport College/Maine PhotographicWorkshops, Rockport, Maine. Faculty. Teach special courses in computer and multimedia skills. Helsinki School of Economics and Business Administration, Interactive Telecommunications Program, Helsinki, Finland. Visiting Professor. Taught graduate course "Introduction to Multimedia Production" during three consecutive summers. 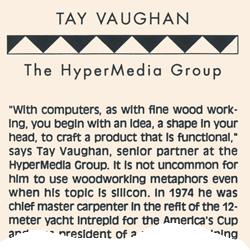 The HyperMedia Group, Inc. a California Corporation, Emeryville, CA. Founder and Senior Partner. Designed and developed custom software applications for multimedia platforms which included digitized audio, color and black & white animated graphics, and integrated television video. Produced large multimedia corporate information systems. Produced custom demonstration software for trade show and public distribution. Key Thinkers, Inc., a California corporation, Oakland. President and CEO. Design and engineer hardware,software, and robotic systems for high-technology environments. Developed a robot and analysis software for scanning HEPA filters in hazardous environments (radiation, chemical, and biohazard). Developed 18 real estate and insurance programs bundled with a NEC laptop computer. Consumer Guide, Skokie, IL. Technical Editor (contract). Edited and wrote original text for The Best of Atari Software. Antic Magazine, San Francisco. Senior Editor. Prepared original material and copy-edited the work ofoutside authors for a monthly microcomputer magazine (circulation approx. 110,000). Bay Area Marine Institute, San Francisco. Founder and President. Directed the day-to-day operation of a maritime training school. Developed long-range planning strategies. Prepared grant and contractapplications and documentation and provided management and educational oversight. Co-founded Floating Point, a computer applications newsletter for naval architects and marine industry professionals.Taught. International Marine Surveyors, Inc. San Francisco. 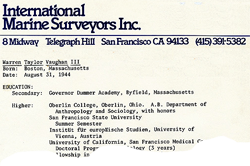 Principal Surveyor. Prepared condition and valuation surveys for vessels of less than 100 tons. Prepared engineering analyses, reports, and documentation. 1975 Charles F. Chapman School of Seamanship, Stuart, Florida. Dean of the School. Prepared curricula and taught navigation skills. Driscoll Custom Boats, San Diego, California. Chief Master Carpenter. Major responsibilities in the rebuilding of the 12-meter yacht INTREPID for the 1974 America's Cup races. Built 31-foot ocean-going sailboat GREAT BEAR. Sailed from San Francisco to Newport, Rhode Island, via Panama, hence to New Orleans. Participated in the 1974 America's Cup races. Language Services Inc., Santa Rosa, CA. Translated from German to English a series of Swiss patentshaving to do with ballistic guidance systems. Prepared documentation and correct language for the U.S. Patent Office. Standard Oil Company, Richmond, CA. Special consultant in community relations. Organized andmanaged segment of cleanup operations in Marin County, CA, following San Francisco oil spill disaster. National Institute of Child Health and Human Development. Contract systems analyst and programmercharged with the management of data acquisition and statistical processing for a national study on ageing. Scientific Analysis Corporation, San Francisco. As chief methodologist, designed and directed an in-depth cost-benefit analysis of the rendition of welfare services under contract to the California State Legislature. Prepared final report. Stars and Stripes Newspaper, Darmstadt, West Germany. Woodwork Shop and Distribution. M.S. Evanger. Ordinary Seaman. Circumnavigated South America via the Straits of Magellan as working crewmember of 10,000 ton break-bulk cargo ship. 1962-68. Oberlin College, Oberlin, Ohio. A.B., Department of Anthropology and Sociology, with honors. Minor in sculpture. 1966. Institute for European Studies, University of Vienna, Austria. 1968-71. University of California, San Francisco Medical Center. PhD Program in Medical Sociology (3 years, DNF). 1970. Graduate fellowship in Human Development, National Institute of Health. U.S. Patent No. 4227246, "Multi-parameter Measurement System for Fluids"
Panelist, speaker, and moderator at technical conferences in computing including MacWorld (since 1988),West Coast Computer Faire, Multimedia Expo, Media ‘92, IICS, New Media in the 90’s, Kodak Photo CDDevelopers Conference, and other venues in North America and abroad. See Presentations.